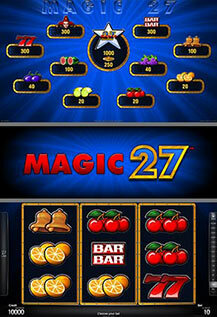 Enjoy your magic win moments with this 27-line and 3-reel fruit game „Magic 27™“. 3 identical symbols win on 27 lines. All prizes are for combinations of the same kind and are paid for combinations from left to right. The JOKER symbol replaces all symbols. 3 STARS trigger the „MAGIC 27-MYSTERY“. In the „MAGIC 27-MYSTERY“ you can win one of six different prizes.